The Sinn 103 Series has become one of the most iconic collections in the brand's history and the design dates back to the early origins of Sinn as a company. Using classic design features such as a domed acrylic crystal, friction fit bezel and solid case back, this pilot's watch maintains a level of authenticity that few do in the market today while remaining in current production. And we decided to turn it up a notch. Up until this point, virtually all watches in the Sinn 103 Collection have been finished with highly polished cases and highly polished bracelets. We were curious to find out how the watch would appear in a matte bead blasted finish so we asked Sinn to produce a prototype which we have been showing at our recent Road Shows. The feedback that we have received has been strongly positive and many people have remarked that the watch takes on an entirely different appearance. In keeping with the traditional methods of production of this watch, we asked Sinn to use hand bead blasting techniques. Rather than produce the case on an automated CNC machine which also would bead blast the case, Sinn first produces the case as a standard 103 case and then the matte bead blasted finish is created entirely by hand. This hand finished blasted finish produces a striking result, and is a time consuming process to correctly complete. The end result is everything that you've always liked about the Sinn 103 in a much more subtle design without the highly polished finish. Of the many variations of the Sinn 103 Series that have been produced over the years, we personally feel that this is one of the most interesting and collectible in the series as it takes on a completely different look. Another advantage to the matte bead blasted finish is an increased resistance to showing scratches and other blemishes which are much more apparent in a highly polished case design. 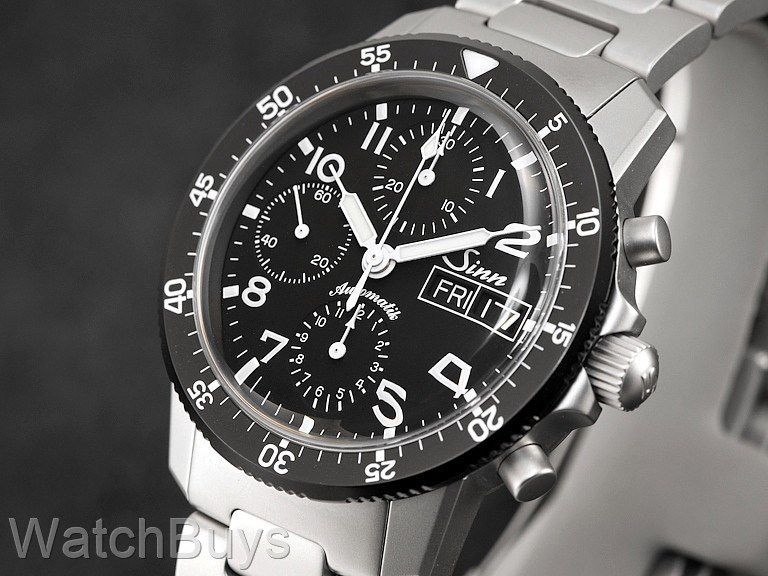 This watch is fitted with a Sinn matte bead blasted stainless steel bracelet with locking clasp. Verified Owner Comments: Great looking watch, the Matted finish makes the watch feels completely different from the polish Stainless steel. Professional service from WB staff. I'm impressed. "Sinn 103 St Special Edition"
Verified Owner Comments: The Sinn 103 had long been on my radar, the classic looks just really work for me. When I saw the special edition in Matte I couldn't resist any longer! I have been wearing the watch non stop since receiving it! Nice box and tool set comes with the watch, Love the cool hex head screws to adjust the bracelet, a nice touch. WatchBuys support was great, called to confirm details prior to shipping, watch arrived well packaged, on time as promised. Excellent all around early Christmas present for myself.